Enamel, ceramic and carpets are examples of the most tradi- tional part of Georgian handicrafts. They make use of the Georgian ornaments both aesthetically and symbolically. These traditions go back to antiquity. Located on the silk road between Europe and Asia, Tbilisi became a market-center for Caucasian handmade carpets and other handicrafts. Here one could meet European and Asian cultural masterpieces, works of Iranian, Turkish, Indian, Chinese, Central Asian and Caucasian handmade carpets. The Georgian carpets are well known for their quality of the weaving technique and the original Georgian ornaments. clay pots for wine-cultivating purposes. 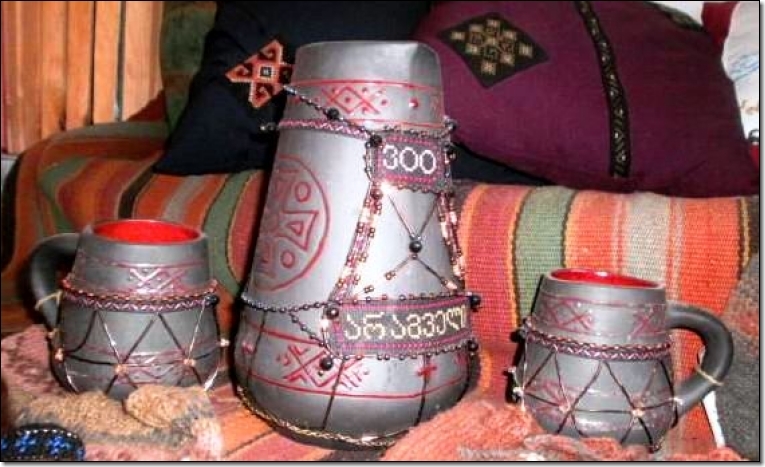 Today pottery takes an important position in Georgian handicraft, using ceramic for barrels, plates and cups for food-making and drinking purposes. There are for example numerous of artistic drinking cups created from ceramic, used for toasting purposes at the Georgian feast, the "supra". Georgian Cloisonné Enamel was developed between the 7th and 13th century, with the blossoming era in the 10th - 12th century. During the following centuries the tradition and technique was lost, however in the second half of the 20th century, cloisonné tradition in Georgia again was revived. The motifs and themes covered by cloisonné have expanded compared to medieval time, with decorative compositions and ornaments alongside with the traditional old samples. 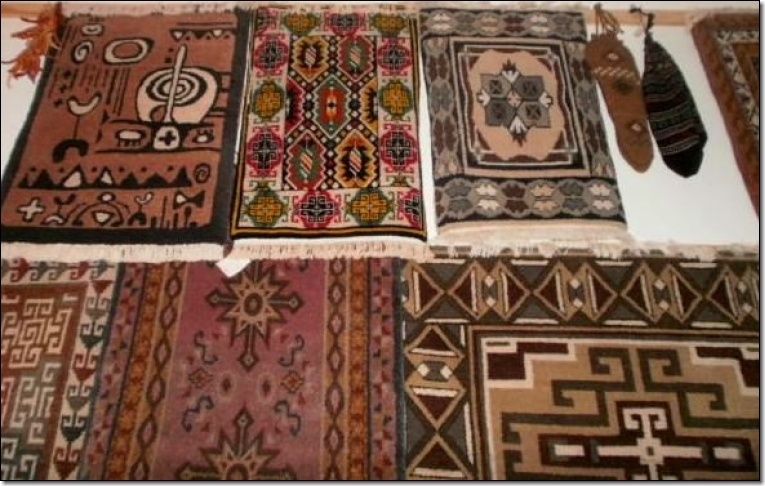 Carpets from the workshop in Dusheti. Ceramics and vowen products from the workshop in Dusheti.